Many veterans are still involved in some way in their local communities and offer to attend veteran functions throughout the municipality. Often these events honor military service in some way and having active duty members and veterans attend is a special occasion for many Americans. 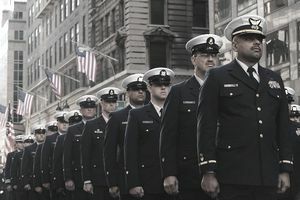 In fact, every Fourth of July, Veteran's Day, and Memorial Day parade you will encounter many proud former military members wearing their uniforms. You may also see retirees and veterans wearing the uniform at retirement ceremonies of military members, funerals, and weddings of close family members. There are specific guidelines for when military retirees and veterans can wear their uniforms. Here's a look at when they can and can't wear their uniforms. Veterans are members who served but did not accumulate 20 years of service, however, they may also wear the uniform but only in special occasions that are typically centered around military service and family events (military wedding / funeral, etc). The rules for wearing military uniforms as a retired military member or a discharged veteran are similar for all the services. There are certain rules for those seeking to wear the uniform for formal functions, national holidays, parades, military funerals and weddings and other military occasions. Only the Service Dress Uniform may be worn; no work, battle dress or PT uniforms are permitted to be worn at formal events. For non-formal events, veterans are allowed to wear other working uniforms as deemed appropriate for the occasion. Grooming standards are obviously not enforced when a veteran wears any of the uniforms, but it is common courtesy to wear the uniform as if you were still in the military conforming to all the hair, facial hair, finger nail, and other grooming standards of the military branch you represent. All veterans and retired members will conform with the same standards of appearance, military customs, practices, and conduct in uniform prescribed for active-duty. At any meeting or demonstration which is anti-government in nature. During political activities, private employment or commercial interests, when an inference of official sponsorship for the activity could be drawn. Retired military members and honorably discharged veterans may wear the rank and insignia currently in use, or the rank and insignia in use at the time of their discharge/retirement, but cannot combine the two. Each branch have similar rules for their veterans to wear the uniform and for what occasions. Check out the official military branch website for the many details that can be different from one branch to the other. Any individual wearing a U.S. military uniform is expected to reflect the high personal appearance standards and esprit de corps that the uniform represents. To this end, particular attention will be paid not only to the correct and military wear of uniform components but also to the individual’s personal and physical appearance. All personnel exercising the privilege of wearing a U.S. military service or dress uniform will comply fully with their service's grooming and weight control standards. Typically miniature ribbons and warfare pins will be worn on retirees and veterans when appropriate. However, full sized ribbons and pins can be worn on Veteran of Foreign War (VFW) uniforms and in some formal occasions. Check your military branch for details on how and when to wear miniatures and full sized medals as they tend to have differing requirements depending upon the event the veteran or retiree is attending.